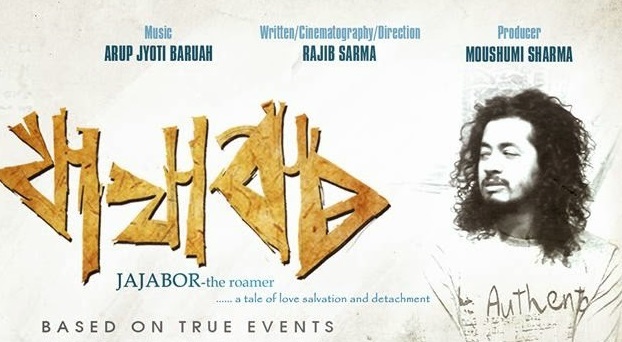 Jajabor, its a new Assamese Film which is now under post production stage is being directed by Mumbai-based cameraperson Rajib Sarma and Produced by Mousumi Sharma. Jajabor is the first venture by Rajib Sharma, an FTII alumni. “I am basically a cameraman staying in Mumbai from last 10 years.After shooting an experimental film last year ,directed by Mr.Ishraq,which was a 4 days shoot(duration-90 minutes) i got the confidence to direct my own script which is very close to my heart since it is based on real life incidents.So I thought why not assamese, my mother tounge. Money always remains a factor in film making, but me and some of my very good selfless friends love towards cinema made JAJABOR happen.So finally I shot JAJABOR in January 2013 in Guwahati and Tura within a span of 6 days with a crew of 20.” said Rajib. A bunch of creative and passionate film lovers help in the making of this film. Director Rajib Sharma mentioned some names like Moushumi Sharma (producer), Lokkhi Borthakur, Samir, Biki Patgiri, Pranjul (JCFTI faculty), his Mumbai based friends Mahesh, Santosh, Devabrota, Subhamoy, Rohit , Swapnil and his hard working,energetic & passionate students. Arup jyoti baruah and Somir did an exceptional work for the songs while Zubeen Garg, Siddharth hazarika and Tarun tanmoy sang the songs whole heartedly. There is a Bairagi song in this Film sung by Lokkhi Borthakur and Arup. Recently Jajabor has officially selected for Nashik International Film Festival (NIFF) 2014. What if one morning we wake up and find somebody is searching for you..a person who doesn’t have any relation with you becomes the reason for your change…its JAJABOR…it enjoys the journey called LIFE..
A 25yr old boy who feels good with his monotonous life but actually not happy..bit confuse underconfident at times,loves the phrase “simple living high thinking”..and feels reluctant to accept the change in any form in his life. A 66 yr old man who is irritating in nature..has dual opinion in various aspects of life,leaves his family for a contract job..
What happens when these two generation meet? Director/Cinematography/Written By – Rajib Sarma. Editors – Mahesh Ghanekar and Pranjul kashyap. Sound Designer – Santosh Kumar. Sound Mixing – Devabrato Chaliha. Music Composer – Arup Jyoti Baruah Dhemali , Kansanjanga, Netherland Theatre Embassy. Jajabor…its a good title… hope the film will more interesting ..